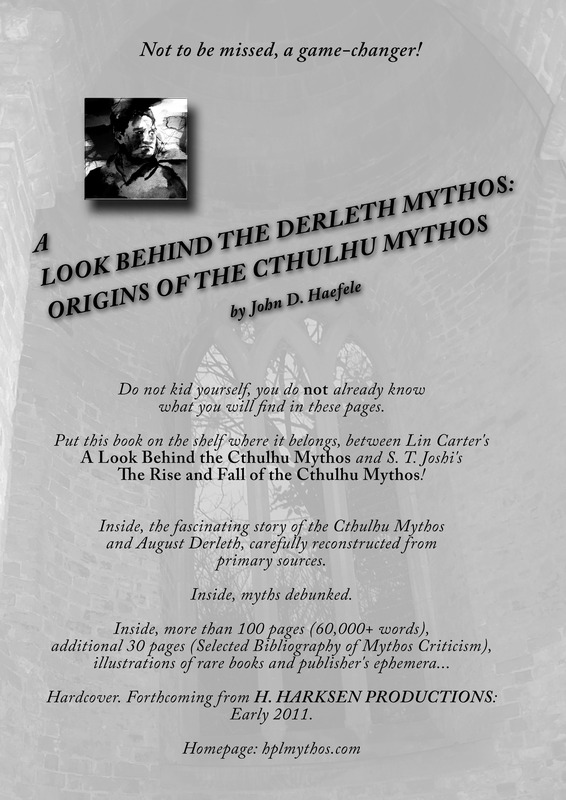 You may recall that I had my initial encounter with John D. Haefele — author of A Look Behind the Derleth Mythos — back in 2002, when he added his research into Arkham House ephemerae to the stack of notes I had on the subject. The result was an article in the October 2002 issue of Firsts: The Book Collectors magazine on all those brochures and stock lists and flyers. If you collect Arkham and don’t have that issue, you should pencil it in on your Xmas Wish List. And for those of us who appreciate ephemerae (I used to knock out flyers and brochures for the Hammett Tour back before the website came along and occupied that environmental niche), Haefele just sent me a scan of what must be the earliest piece of ephemerae for his Derleth Mythos project: a single sheet broadside announcing the forthcoming first edition hardcover of the book from Danish publisher Henrik Harksen. He believes about 100 of these sheets were printed up and laid out on a table for just such flyers for the Mythos Con in Arizona in January 2011. The intended publication date of “Early 2011” was overly optimistic. They barely squeaked the book out just before the end of 2012. Then the hardback had all of 2013 and most of 2014 to itself, before the completely revised and expanded trade paperback came alive in September. As I’ve mentioned, I’ve been making a little hobby of following how Derleth Mythos is doing on the Amazon bestseller list for Horror Litcrit. It seems to hold down the no.2 or no.3 spot most days for over two months now, and at this moment is no.5. Occasionally it slips out of the Top Ten, and for a couple of days dropped out of the Top Twenty. The most startling thing I noticed, however, was that the first edition hardcover from Harksen’s press suddenly cracked the Top Twenty. What the hell. The revamp costs under $20 — but the Harksen edition was initially selling in the $50-$60 range. When I spotted it in no.11 place on November 16 (the trade paper was at no.4), the asking price had jumped closer to $90. Lately the prices have soared. On ABE books today a single copy is listed for $696 (yes, $696, not a typo), and the last one listed for sale on Amazon — before they put the Harksen in the out-of-print category — was asking $1222.06. I don’t know the reasons why (other than that Derleth Mythos is the best book on the subject ever done), but obviously Haefele is the object of some rampaging hyper-modern inflation. Like Stephen King back in the day. If you’re hesitant to jump in with prices surging from $60 to over a thousand in just two months, here’s a collectors tidbit for you: Haefele tells me that the Harksen first edition hardcover apparently sold less than one hundred copies, and of course has been pulled from the market. The complete universe of available copies is in two figures, and I have no intention of selling my copy. Haefele’s Heretics have all assured me they are keeping their copies. Collectors who didn’t get in fast may simply have to get in large. And as for the two days when Haefele in the new trade paperback dropped out of the Top Twenty — December 6 and 7 — on December 6 the Harksen hardback muscled back in at no.5, and no.15, and no.19. I guess you can’t say Haefele wasn’t in the Top Twenty that day if he cracked the list with $90-and-above copies of his book. This entry was posted in Lit, News and tagged Arkham House, August Derleth, Book Collecting, Cthulhu Mythos, Firsts, Haefele's Heretics, Henrik Harksen, John D. Haefele, Lovecraft. Bookmark the permalink.